<?xml:namespace prefix = o ns = "urn:schemas-microsoft-com:office:office" />Our climate, resources and social relationships constantly evolve. Architects and Designers cannot be reactive, designing only for static criteria existing at the time of a brief. Their role must be proactive, anticipating the evolving environment both physically and socially and responding in ways which are both environmentally sustainable and supportive of our quality of life. Blowhouse is a concept house developed by Paul Morgan Architects in association with Felicetti Consulting Engineers. The project was commissioned by the Mornington Peninsula Regional Gallery in 2008 and received an Honourable Mention at the 2009 AA Prize for Unbuilt Work. It anticipates our living conditions in 2030. In this context the challenge is how to survive the environment. Our proposed blowhouse is a ‘life support unit’ (LCI). As with other future dwellings our approach is one of ‘terraforming’, or the creation of a survivable micro-ecology, an example being the structures built to create a life supporting atmosphere in the 1986 film Aliens. The site for the blowhouse is adjacent to The Blowhole, a small promontory to the west of Flinders on the Mornington Peninsula’s southern coastline. The design principle of the bioengineered blowhouse is to create an energy neutral life support unit that utilises the environment’s kinetic potential. The blowhouse is a kind of lung. Strong prevailing winds blow across the curved skin, raising and lowering it. In effect, the blowhouse is breathing. Solenoids attached on the underside of the roof transform the energy produced by the roof’s movement into static electricity. In 2030 the site is no longer grazed by methane producing domestic farm animals like cows. The arid climatic conditions mean that indigenous animals which produce near zero methane, like kangaroos and wallabies, now occupy the area. These animals can be farmed for meat and pelts. Through the use of CFD (computational fluid dynamics) the design team Paul Morgan Architects and Felicetti Consulting Engineers has been able to analyse the intensities of wind velocity and pressure onto the site and life support unit. The purpose of the CFD analysis is to create a surface of constant velocity which reduces local high pressure concentrations onto the LCI’s skin, thus reducing the amount of structure and embodied energy (life cycle cost of producing structural materials) required to build the structure by relying on shape rather than mass. A. Through the use of streamlining the skin is curved in section, thus creating uplift. Strong prevailing winds create a constant gentle raising and lowering of the skin. In effect, the blowhouse is breathing. The external envelope is a semi-rigid pneumatic exoskeleton. It is filled with air and enclosed in a recycled rubber double skin and a secondary layer of composite foamed wood insulation. Several ‘bicycle chain’ beams assist the wave effect of the roof’s movement, and stop it from sagging or collapsing. Piezoelectric solenoids attached on the underside of the roof transform the energy produced by the roof’s movement into static electricity. B. 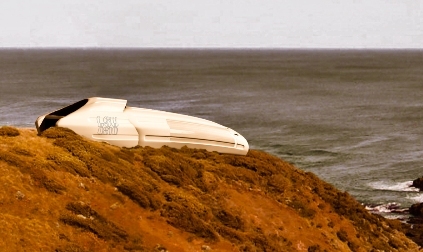 The streamlining also supplies air to linear wind turbines. C. Photovoltaic cells on the rear louvres generate energy from solar radiation. The three energy sources generate energy over different cycles (for example when it is windy but overcast the solenoid and turbine energy will be produced but little solar energy). Water is harvested from flutes on the shell which act as gutters to collect rainwater. It is then directed into an internal glass water tank located in the kitchen ‘bridge’. The water temperature remains at around 21 degrees, and ambiently assists in maintaining the internal air temperature at this level. A heating element sourced from the photovoltaic panels keeps the water temperature warm during the cooler months. Entry is from the land side. The blowhouse is open planned and intergenerational. The three bedrooms are plastic bubbles, inflated at night and attached to external windows. They are surrounded by fixed pods which contain bathroom, clothes room (shared) and laundry/store/utility room. The kitchen is the ‘bridge’ of the LSU (as in ship’s bridge). It is the locus of the blowhouse, both in terms of survival (food preparation, water) and symbolism (internal water tank). Flutes on the roof have the effect of firstly accelerating wind by producing a ‘fluttering’ effect and encouraging the ‘lung’ effect of the moving roof and secondly accelerating the wind into a narrow air gap formed by the shell of the rigid rear section (a Venturi effect). With the second effect air is forced into a linear air intake which then operates the cylindrical wind turbines. Rear louvres shade the interior from the north sun: a light-scoop directs sunlight into the interior during winter.